So Vintage Astronomy I went. 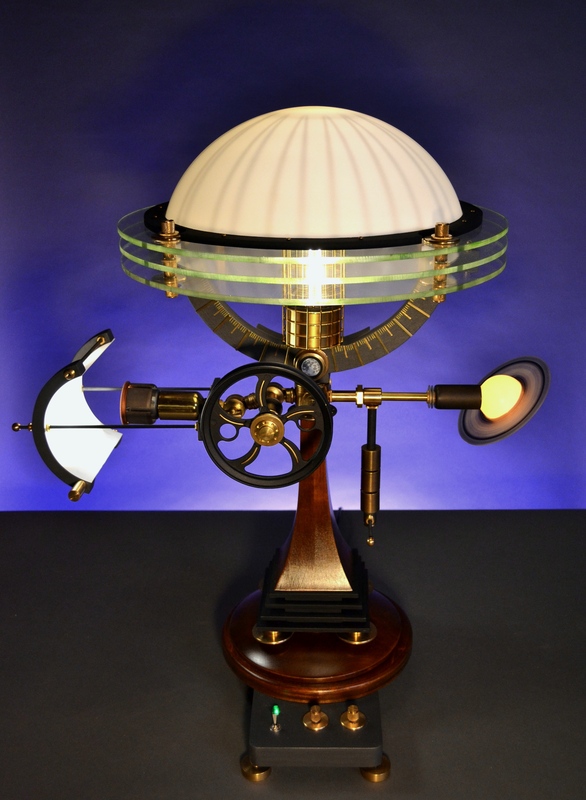 "Astronomea" has two optional domes: One in white for ambient light at his desk at Goddard/NASA and one with a rear-pained "Jupiter" for when he's in an "astronomical" mood. The tapered maple base reflects the shape of the Harvard "Great Refractor" Telescope commissioned in 1847-the very first telescope commisioned by the U.S. government.. The task lamp has a diffuser inspired by the barn doors on observatory domes. The arc with brass markers reminiscent of navigational sextants. Hand painted Jupiter, Moon and Saturn rings with custom brass dimmer knobs. All in, the lamp has the look of a small scale astronomical device from the 19th century.